Money is the dam of Merganser's Classic Rip-N-Tear MH. Money was spayed after whelping three litters. Money spent her retirement with Bill and Elizabeth Gaar and family. 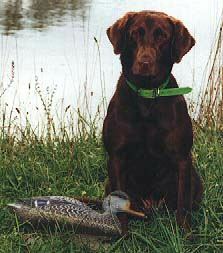 Money enjoyed being a full-time house dog, faithful companion to the children, Elizabeth's running partner, and her favorite activity - retrieving upland birds and waterfowl for Bill. Money died at the age of 11 in August of 2004.